Inspire: Can attack as normal this turn. 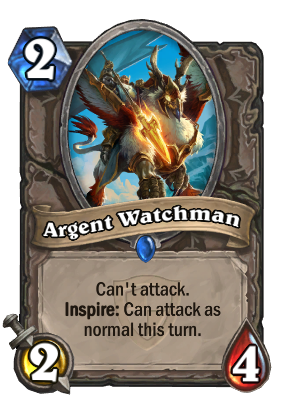 Who argent watches the Argent Watchman? Would be pretty cool as a 1-drop, though it might have to be a 2/3 in that case. In its current form it's unplayable in Arena and even worse in Constructed. Would see play if it was a 3/4. But, since it's a 2/4, will never see constructed play. This thing is the #1 counter to shielded minibot. Coin it on turn 1, ping with mage hero power and demolish bot. Really solid. Also, this guy is super unassuming, and is therefore super sticky on the board. Useful for Echo of Medivh, and super inspire turns. This guy shares the same principle as all Inspire minions. If you think of him as activating every turn, he's almost OP. If you think of him as eating up 2 mana every turn for that effect, he's useless. However, in situations where you either were going to Hero Power anyway or when you have multiple Inspire minions out or when you have cards like Maiden of the Lake to have synergy with the hero power, that's when you see value. One thing I noted in the Tavern Brawl is that one of the greatest strengths of the Inspire minions is their flexibility to react to anything your opponent does. Say you go first and open with a Lowly Squire; if your opponent plays a two drop, you can hero power and handle it. If your opponent doesn't, then you can play a two drop, especially a second Hero Power based minion to put further pressure on the opponent. That's exactly the kind of dept cards in MTG have. But the brilliant MBA types at Hearthstone don't want the game to be too complicated, because that will ruin the market (casual players) they are chasing. Can't this essentially have charge at Turn 4 with hero power and this card played in one turn? Can attack as normal this turn. I think that wording suggests you couldn't attack with it the turn you played it. Not clearly though. It clearly states that you can't EVER attack unless you use Inspire. And of course it hasn't charge, so no attack on the turn you played it. Using hero power on turn 3 is really bad and the stats aren't that good for it's handicap. I'd rather any other 2-drop with an extra ability than this card. The art is incorrect, should have been from troll race. This card is a really cool idea, but they poorly executed it. Its stats are too garbage to warrant anybody using this card. You have to pay 4 mana for a 3 mana card that won't work if you don't keep paying two mana every turn it's alive after that. This really needed to have 8 stat points like 4/4 or maybe if that's too unbalanced for you then 5/3 or whatever combination tickles your fancy. So this card has the intention of slowing down the meta by having the means of cleaning up aggro. I mentioned this before, but this card ends up being slightly too slow to be used in that sense. Maybe if this card cost 1 mana, so you never have to rely on coin? It doesn't curve too well considering usually control only runs 1 drop being chow. I feel like the text could be tweaked a bit like giving it the text *This card cannot attack the enemy hero Inspire: can attack as normal this turn. I really want this card to work, but I don't know if it will in it's current condition. I imagine this card might be used in a zoolock kind of deck, or possibly a mid range demonlock as the tapping of the warlock might make it good if you draw it around turn 4 or 5 when you start to run out of cards and begin tapping every turn in zoo. The only other thing i can see this card working in is a newer players aggro hunter where they have empty slots that need filling; could make a "very nice 4 damage each turn" the new player thinks to himself...2 turns later...salt showers the board as the player loses. Unless we get better Inspire card synergy, this is one of the most terrible cards in the set!